I teach classes in local schools, give tours of the shelter, hold our monthly lecture series, and run our humane-theme camp for kids in the summer. I went straight from finishing my B.A. to the MAPP program. I was also working as a dog trainer at the time. MAPP is the only program I could find that really focuses on the intersection of humans and animals and how they affect each other. I’ve always been interested in the behavior of domesticated animals, but as I gained experience through work and internships while I was getting my bachelor’s degree, I was surprised by how much human behavior and policy was involved. I joined MAPP to learn more about the connection between humans and animals in society. 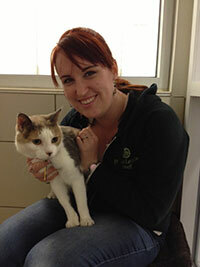 The MAPP program has given me a base of knowledge about a wide variety of animal issues. Some of those issues have turned into lesson plans for the classes I teach in schools. It has been especially helpful in our 7th grade class series where we go deeper into topics such as pet overpopulation, animals kept in captivity, and endangered species, and touch on topics such as breed-specific legislation, puppy mills, and TNR. Because of the MAPP program, I can give a thorough explanation of the issue as well as the policy surrounding what’s going on, and I also feel confident responding to students’ questions. Due to my experience in the MAPP program, I was also placed on the Potter League’s new Advocacy and Public Policy Committee. We evaluate new legislation in RI and determine the Potter League’s position and further action, as well as building relationships between the Potter League and other organizations, such as the RI Domestic Violence Committee and the local homeless shelter (for people). The connections I’ve made through the MAPP program have also helped me know where to go to get materials for my programs, as well as provided me with contacts for speakers for my camp program and other lectures which I organize. My January preceptorship led into my final project. I looked at visitor surveys at the Animal Rescue League of Boston’s shelter in Boston. I then compared adopters vs. non-adopters and cat people vs. dog people, looking at their impressions of the shelter, thoughts about the animals, and their expectations for a pet. My project solidified my love of shelters and confirmed that animal shelters are where I want to make a difference in the lives of animals. It also showed me how critical public perceptions are to the success of adoption efforts. By becoming an educator, I knew that I could change hearts and minds. I think what I enjoyed most was the variety of speakers we met from all aspects of animal welfare. It was really interesting to hear about the issues from their point of view and learn about their jobs and history in the field. I was uninformed about all of the job opportunities available in the field, so it was really helpful to learn about all the options. 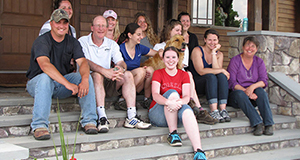 The MAPP program is fantastic for anyone who is interested in any aspect of animal welfare. The class size is small and every teacher truly cares about each student as an individual. Due to the range of topics covered, it’s easy to find something that you’re passionate about, and the format of the course work and projects allows you to build on that passion and find a future career.